Illegal Immigrants are ILLEGAL and are Hurting America! Here's some FACTS that the lying U.S. Department of Labor won't tell you... 84 California hospitals are closing their doors as a direct result of the rising number of illegal aliens and their non-reimbursed tax on the system. Cristobal Silverio emigrated illegally from Mexico to Stockton, Calif., in 1997 to work as a fruit picker. He brought with him his wife, Felipa, and three children, 19, 12 and 8 – all illegals. When Felipa gave birth to her fourth child, daughter Flor, the family had what is referred to as an "anchor baby" – an American citizen by birth who provided the entire Silverio clan a ticket to remain in the U.S. permanently. But Flor was born premature, spent three months in the neonatal incubator and cost the San Joaquin Hospital more than $300,000. Meanwhile, oldest daughter Lourdes married an illegal alien gave birth to a daughter, too. Her name is Esmeralda. And Felipa had yet another child, Cristian. The two Silverio anchor babies generate $1,000 per month in public welfare funding for the family. Flor gets $600 a month for asthma. Healthy Cristian gets $400. While the Silverios earned $18,000 last year picking fruit, they picked up another $12,000 for their two "anchor babies." While President Bush says the U.S. needs more "cheap labor" from south of the border to do jobs Americans aren't willing to do [you mean, can't afford to do], the case of the Silverios shows there are indeed uncalculated costs involved in the importation of such labor – public support and uninsured medical costs. In fact, the increasing number of illegal aliens coming into the United States is forcing the closure of hospitals, spreading previously vanquished diseases and threatening to destroy America's prized health-care system, says a report in the spring issue of the Journal of American Physicians and Surgeons. "The influx of illegal aliens has serious hidden medical consequences," writes Madeleine Pelner Cosman, author of the report. "We judge reality primarily by what we see. But what we do not see can be more dangerous, more expensive, and more deadly than what is seen." According to her study, 84 California hospitals are closing their doors as a direct result of the rising number of illegal aliens and their non-reimbursed tax on the system. "Anchor babies," the author writes, "born to illegal aliens instantly qualify as citizens for welfare benefits and have caused enormous rises in Medicaid costs and stipends under Supplemental Security Income and Disability Income." In addition, the report says, "many illegal aliens harbor fatal diseases that American medicine fought and vanquished long ago, such as drug-resistant tuberculosis, malaria, leprosy, plague, polio, dengue, and Chagas disease." While politicians often mention there are 43 million without health insurance in this country, the report estimates that at least 25 percent of those are illegal immigrants. The figure could be as high as 50 percent. Not being insured does not mean they don't get medical care. Under the Emergency Medical Treatment and Active Labor Act of 1985, hospitals are obligated to treat the uninsured without reimbursement. "Government imposes viciously stiff fines and penalties on any physician and any hospital refusing to treat any patient that a zealous prosecutor deems an emergency patient, even though the hospital or physician screened and declared the patient's illness or injury non-emergency," says the report. "But government pays neither hospital nor physician for treatments. In addition to the fiscal attack on medical facilities and personnel, EMTALA is a handy truncheon with which to pummel politically unpopular physicians by falsely accusing them of violating EMTALA." According to the report, between 1993 and 2003, 60 California hospitals closed because half their services became unpaid. Another 24 California hospitals verge on closure, the author writes. "American hospitals welcome 'anchor babies,'" says the report. "Illegal alien women come to the hospital in labor and drop their little anchors, each of whom pulls its illegal alien mother, father, and siblings into permanent residency simply by being born within our borders. Anchor babies are citizens, and instantly qualify for public welfare aid: Between 300,000 and 350,000 anchor babies annually become citizens because of the Fourteenth Amendment to the U.S. Constitution: "All persons born or naturalized in the United States, and subject to the jurisdiction thereof, are citizens of the United States and the State wherein they reside." 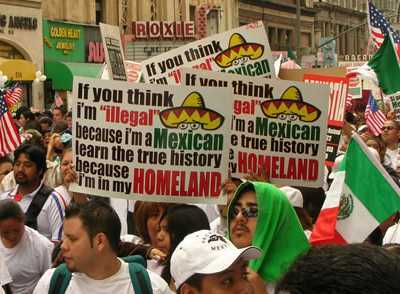 Among the organizations directing illegal aliens into America's medical systems, according to the report, are the Ford Foundation-funded Mexican American Legal Defense and Education Fund, the National Immigration Law Center, the American Immigration Lawyers Association, the American Bar Association's Commission on Immigration Policy, Practice, and Pro Bono, the Immigrant Legal Resource Center, the National Council of La Raza, George Soros's Open Society Institute, the Migration Policy Institute, the National Network for Immigration and Refugee Rights and the Southern Poverty Law Center. Because drug addiction and alcoholism are classified as diseases and disabilities, the fiscal toll on the health-care system rises. When Linda Torres was arrested in Bakersfield, Calif., with about $8,500 in small bills in a sack, the police originally thought it was stolen money, explained the report. It was her Social Security lump sum for her disability -- heroin addiction. "Today, legal immigrants must demonstrate that they are free of communicable diseases and drug addiction to qualify for lawful permanent residency green cards," writes Cosman, a medical lawyer, who formerly taught medical students at the City University of New York. "Illegal aliens simply cross our borders medically unexamined, hiding in their bodies any number of communicable diseases." Many illegals entering this country have tuberculosis, according to the report. "That disease had largely disappeared from America, thanks to excellent hygiene and powerful modern drugs such as isoniazid and rifampin," says the report. "TB's swift, deadly return now is lethal for about 60 percent of those infected because of new Multi-Drug Resistant Tuberculosis. Until recently MDR-TB was endemic to Mexico. This Mycobacterium tuberculosis is resistant to at least two major anti-tubercular drugs. Ordinary TB usually is cured in six months with four drugs that cost about $2,000. MDR-TB takes 24 months with many expensive drugs that cost around $250,000 with toxic side effects. Each illegal with MDR-TB coughs and infects 10 to 30 people, who will not show symptoms immediately. Latent disease explodes later. TB was virtually absent in Virginia until in 2002, when it spiked a 17 percent increase, but Prince William County, just south of Washington, D.C., had a much larger rise of 188 percent. Public health officials blamed immigrants. In 2001 the Indiana School of Medicine studied an outbreak of MDR-TB, and traced it to Mexican illegal aliens. The Queens, New York, health department attributed 81 percent of new TB cases in 2001 to immigrants. The Centers for Disease Control and Prevention ascribed 42 percent of all new TB cases to 'foreign born' people who have up to eight times higher incidences apparently, 66 percent of all TB cases coming to America originate in Mexico, the Philippines and Vietnam." Chagas disease, also called American trypanosomiasis or "kissing bug disease," is transmitted by the reduviid bug, which prefers to bite the lips and face. The protozoan parasite that it carries, Trypanosoma cruzi, infects 18 million people annually in Latin America and causes 50,000 deaths. The disease also infiltrates America's blood supply. Chagas affects blood transfusions and transplanted organs. No cure exists. Hundreds of blood recipients may be silently infected. Leprosy, also known as Hansen's disease, was so rare in America that in 40 years only 900 people were afflicted. Suddenly, in the past three years America has more than 7,000 cases of leprosy. Leprosy now is endemic to northeastern states because illegal aliens and other immigrants brought leprosy from India, Brazil, the Caribbean and Mexico. Dengue fever is exceptionally rare in America, though common in Ecuador, Peru, Vietnam, Thailand, Bangladesh, Malaysia and Mexico. Recently, according to the report, there was a virulent outbreak of dengue fever in Webb County, Texas, which borders Mexico. Though dengue is usually not a fatal disease, dengue hemorrhagic fever routinely kills. Polio was eradicated from America, but now reappears in illegal immigrants as do intestinal parasites, says the report. Malaria was obliterated, but now is re-emerging in Texas. Closing America's borders with fences, high-tech security devices and troops. Rescinding the U.S. citizenship of "anchor babies." Punishing the aiding and abetting of illegal aliens as a crime. An end to amnesty programs. Let me repeat a fact from the preceding article in case you missed it... "84 California hospitals are closing their doors as a direct result of the rising number of illegal aliens and their non-reimbursed tax on the system." Yet, congress does nothing. The White House does nothing. Our government does nothing. The ultimate consequences of illegal immigration into the United States cannot be calculated; but the visible damages are already shocking. Criminals: Go Back to Mexico!